It's a beautiful cool day here in Kansas in August after quite a bit of rain yesterday as well. Quite unusual for this time of year but after how hot and humid it's been it's quite enjoyable. 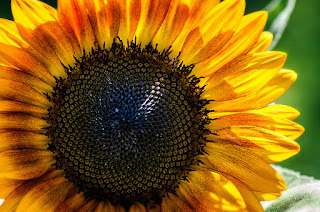 Last week I posted a Sunflower field shot and today I thought I would post a close up. This one I took recently on one that I grew in my garden. It's obviously of the red variety. I love how the petals resemble little flames of fire.